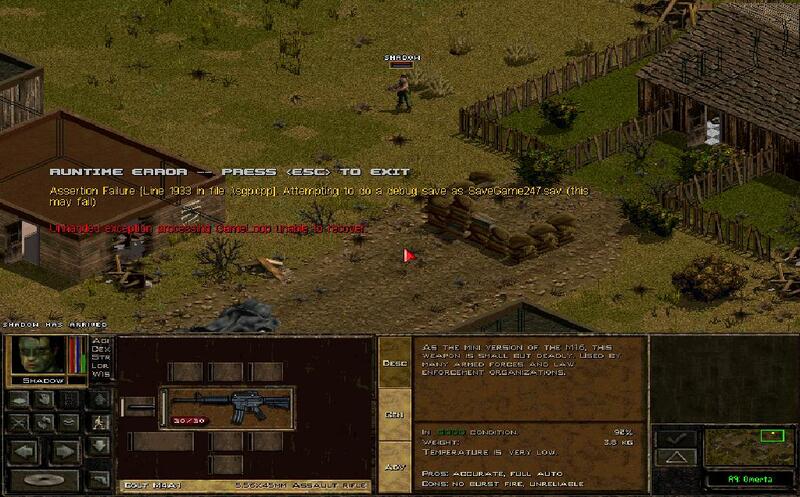 I have Jagged Alliance 2 Gold with 1.13 full release 4870 installed, update/bugfix for that version and latest SVN files. I'm getting Runtime Error everytime I try to mount or unmount attachments on weapons. I use Windows XP with SP3. I was searching the web but I haven't found anything about it... Could anyone help? Thanks. Get rid of that messed up install of yours and try again with either 4870 + bugfix or latest dev version (don't forget latest exe, 5520 is somewhat older than the gamedir already). Thanks for the welcome and answering my post. -Gold with 4870 and bugfix works great as always. -Gold with latest dev version files from SVN (without 4870 and bugfix) still crashes. You mean that I need a diffrent exe version to make it work? Yes, there's probably been some addition the old one doesn't like. Just get the newest from my signature.